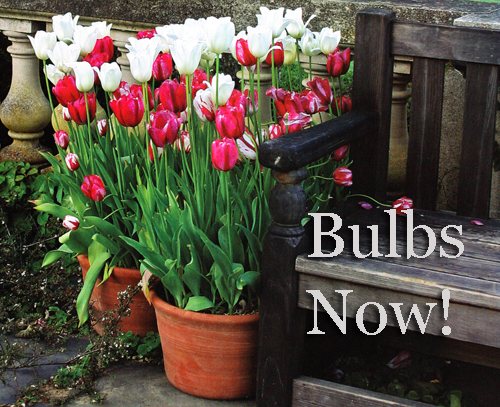 Fall is here so now is the time to be thinking about planting the spring bulbs you have been dreaming about all year. Whether you plant them in your garden or are thinking about trying to pot them up in a garden container, the fact remains that these flowers are stunning. And, so easy to grow! With a little effort up front you will be blessed with a ton of colorful flowers. The best part is that every year they will expand and increase in volume. Who can ask for anything better than that? 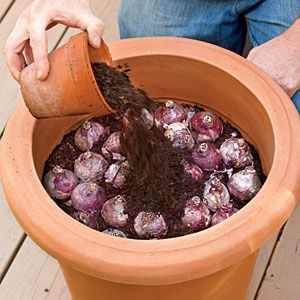 There are a few ways to pot up bulbs but we would like to give you more details on how to stack them inside a garden flowerpot. Of course, the first thing you must do is select the container that you will use to pot in. Do you like terracotta, the natural clay pottery that breathes and ages over time? Maybe you prefer a high shine glazed planter. 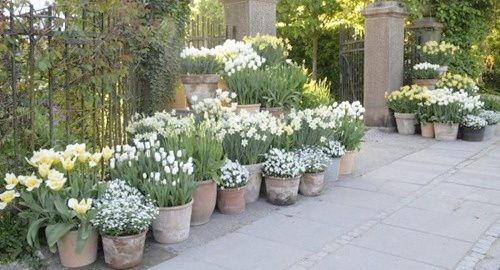 Just make sure that whatever planter you select you want to have enough room for the bulbs to stack. The larger the pot the larger display of color you will be rewarded with. Also, make sure that there is a drain hole in the bottom. If it doesn�t then you can read more here about how to drill your own hole. First, select the type of bulbs you want. Go to your local Nursery or Garden Center or order online. Most bulbs will need 6 to 8 inches of soil at a minimum. Take into account how tall they will grow. Since we are going to stack them, start by putting the larger bulbs on the bottom of the pottery. Did you put the pointed end up? Good! Cover with about 2 inches of soil and then start your next layer putting the smaller ones on top. When you pot them like this the smaller will bloom first next spring and the larger will fill in after. 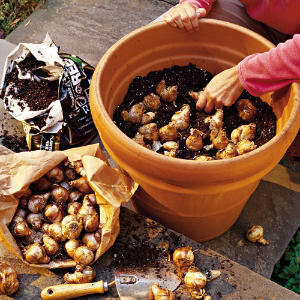 Try to have at least 7 bulbs in a pot and remember that the more bulbs the more blooms. Lastly always use new and good potting soil. You can�t use dirt out of the ground for many reasons. Fill your pot with potting soil up to a few inches from the rim. Then move the pots inside the garage if they can�t stay out all winter. Your bulbs may like the cold but not all garden pottery is meant to sit outside. Then when the weather starts to warm up move them outside and place in a sunny spot. Good luck and share with us how you did! Read more..... Fairy Gardens are Fun! Read more..... Tips for potted gardens.